The field of robotics has gone through considerable changes in the last few years, especially in the field of humanoid robots. Humanoid robots are made in a specific manner to resemble a human being. But that’s seemingly not enough. The resemblance, according to the researchers must not be enclosed within the realms of looks. It must spread its wings to other important human aspects like intelligence and actions. The robot has to look like a human being, feel like a human being and behave like a human being. More and more effort is being given in the field of artificial intelligence (AI) to make robots smarter and more efficient. This Turing test is designed in a way that tests the intelligence of a machine and if it can resemble itself to that of a human being, it passes the test. How does this test do the job of testing the intelligence of a robot? We’ll see to that in this article. The Turing test was developed in 1950 by Alan Turing to test a machine’s capability of exhibiting intelligent behavior similar to that of a human being. The objective was to imitate a human being not limiting to looks or appearance only but also include the intelligence. If the machine successfully disguised itself as a human being, it passed the test. It was undoubtedly a pretty simple objective. The test would take place between a human and a machine in the presence of an evaluator who should also be a human. The evaluator should only be aware of the fact that he’s testing a human being and a machine but he would not know the fact that which one among them is the machine and which one is the human. The evaluator would converse with both of them in the form of text so that speech recognition doesn’t act as a barrier in the test. The conversation is just limited to each individual’s screen. The goal is that the machine will have to behave as humanely as possible in such conversation thereby disguising itself from the evaluator. If the evaluator fails to detect the machine among the two or makes a wrong choice, the machine passes the test. 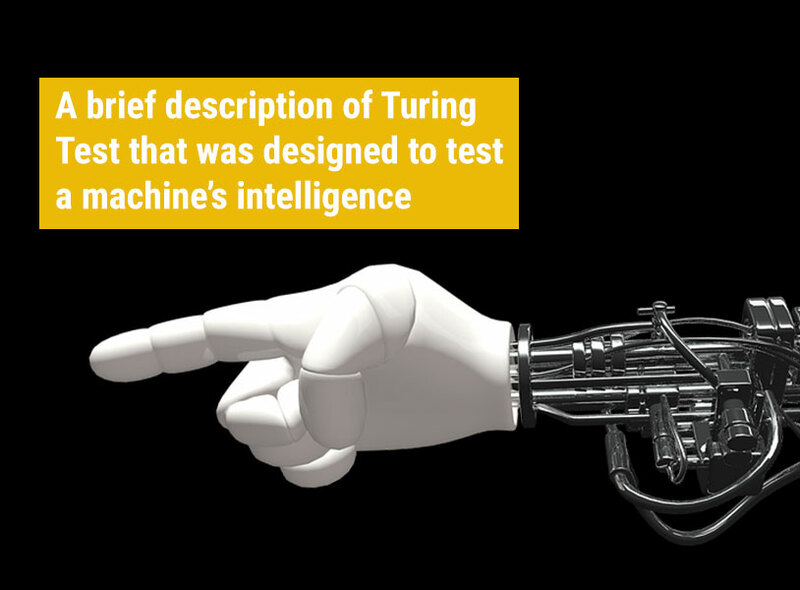 Turing test’s simplicity is the main reason behind its appeal in the field of artificial intelligence. The definition of “intelligence” from the point of view of machines is very hard to conceive even if you compare the same with that of the human mind. Yet, Turing test, which is definitely not perfect from all angles strive to fulfill that category to a certain level and in our opinion does the job reasonably well. This test format helps the interrogator by providing him/her a variety of options to test a machine’s capability in performing intellectual tasks. The test can be performed in natural language which should be a big positive in our opinion because the language barrier isn’t there for the test inconvenience. Plus, the test doesn’t involve any voice. Only text is involved. Hence, the interrogator cannot recognize whether s/he is talking to a machine or a human on the sole basis of voice recognition. We would like to point out this more obvious weakness first. The test doesn’t actually test the intelligence of a machine. It only checks whether the intelligence of a machine is similar to that of a human being or not. But intelligence varies from humans to humans. Hence, it can be said that Turing test cannot check the general intelligence of the machine. Turing test’s simplicity makes it a standout among the lot for testing intelligence of machines. AI is a fascinating subject and bears a lot of potentials. A robot can be considered the perfect imitation of a human being only if it passes this test successfully. We’ll sign off for now. Hope you had a good read.